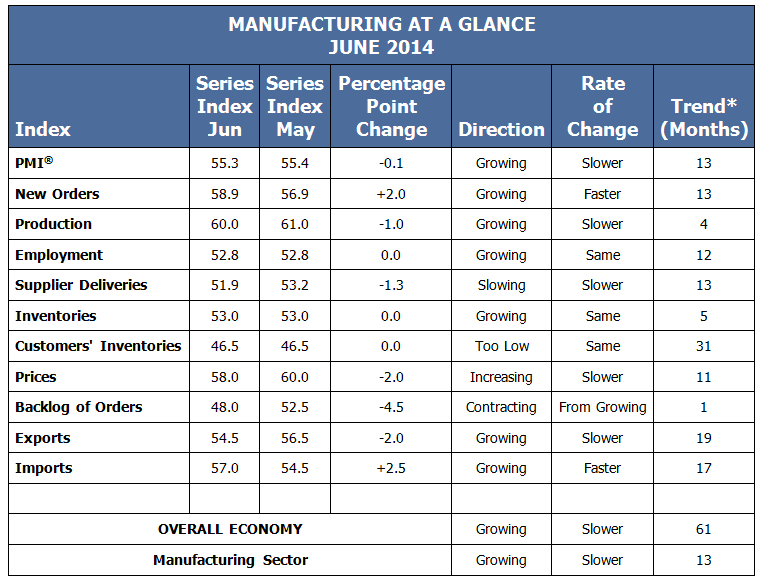 Another month, another solid reading for the overall economy and the manufacturing segment in particular. Today’s Purchasing Managers’ Index (PMI) reported by the Institute of Supply Management (ISM) is another meaningful indicator that suggests last week’s revised steep drop in reported 1st quarter Gross Domestic Product (GDP) will likely prove to be statistical “noise”. ”“The past relationship between the PMI® and the overall economy indicates that the average PMI® for January through June (54.0 percent) corresponds to a 3.6 percent increase in real gross domestic product (GDP) on an annualized basis. In addition, if the PMI® for June (55.3 percent) is annualized, it corresponds to a 4.0 percent increase in real GDP annually. The +3-4% implied GDP growth rates are a far cry from recession or serious economic trouble that some pundits gleaned from last week’s rotten GDP report. Most importantly, the key leading indicator within the PMI report (New Orders) also continues to suggest the expansion has solid underpinnings. The table below contains the details of today’s report. In financial statement analysis at the company level, assessments about the “quality” of earnings reports are common practice. The assessments attempt to render judgment whether companies are “reaching” and doing unsustainable things to match or exceed quarterly earnings forecasts to please and appease investors. Perhaps the “quality” concept be applied to macroeconomic reports as well. Our belief is that while the pace of economic expansion is slower than most anyone wants, it is high-quality in the following sense. Growth is occurring without—so far–the types of excesses in debt and inflation that can boost growth for a period of time, but ultimately prove unsustainable (or intolerable by policymakers) helping sow the seeds of the next recession. “High quality” in this context likely means a long business expansion lies yet ahead. This should provide a decent runway for corporate earnings growth and the stock bull market. The domestic manufacturing sector continues its renaissance as new productivity tools enabled by technology proliferate.